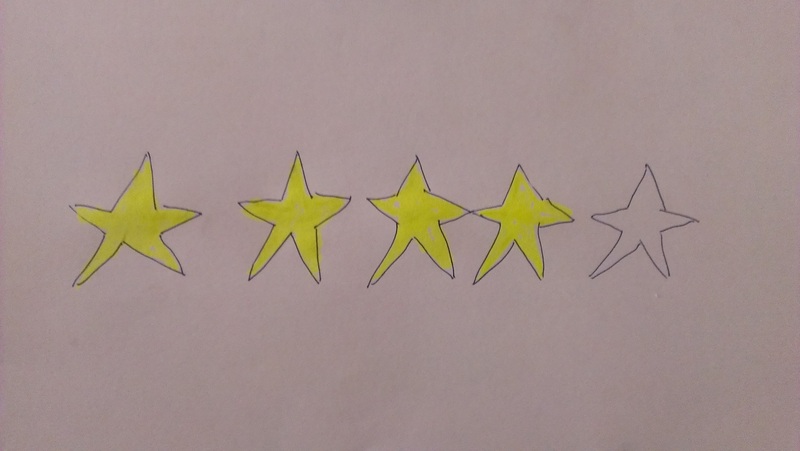 If you are looking for a star rating I’ll save you the trouble of scrolling to the bottom of the page. 4 out of 5 stars for the Google Chromecast device. Here, in all its glory, is my Google Chromecast review. I bought the Chromecast for $35. You can grab one for that same price at your local electronics store or online at Amazon or Google Play. When it was initially launched Google sweetened the pot by adding 3 free months of Netflix to the deal – even if you were already a subscriber. That added $24 value made it a no brainer for me. Unfortunately they halted that deal less than 24 hours after the launch. Big bummer. Still, $35 for this dongle that can help you cut the cord is a steal. It’s hidden. You can’t even see it! It’s behind my TV doing all sorts of wondrous things without even taking up any visual space in my living room. I think that’s awesome. One end is plugged into an HDMI port and the other end is plugged into a USB port (for power) on the back of my TV. No. Messy. Wires. It works with my phone. It is nice not to have another stupid remote on my coffee table. I control the device with something I already have in my pocket – my smartphone. Can you tell that I hate clutter? Great picture. It hooks up to the back of my TV via HDMI. That means that it’s able to produce a hi definition picture. I was worried that with my super slow cheapo internet ($14.95 a month) I was going to have issues getting a crisp and clean picture on my 42 inch TV. That hasn’t been the case at all. The Chromecast is delivering a fantastic quality picture to my telly. It makes Netflix awesome. My wife and I used to watch our streaming movies and TV shows on our computer. It wasn’t awful. But now it feels totally different. We watch more Netflix than ever before (not necessarily a good thing). I’ve always heard great things about Roku but was too cheap to buy one. I’m sure it is lovely but since I’m already used to accessing my Netflix account via mainly my computer and smartphone it is nice to still have those as my main interface to watch via Chromecast. Other folks can use it. My mom came over to babysit our little tike the other day. We hooked her up to our wifi and she was able to watch a couple of shows while the baby slept. She used our account because she isn’t a Netflix subscriber but she also could have easily used her own. That’s a pretty cool feature. I’m pretty sure it isn’t nearly as easy to use another account on Apple TV or Roku. Sometimes the remote (my phone) doesn’t work properly. This is definitely the most annoying thing I run into. It’s awesome that I can control what I watch with my phone. But then if I reply to a text or check my twitter feed while watching, it can mess up the remote connection. I usually have to log back in to Netflix in order to then pause or stop the show. I haven’t read that others have experienced this problem so it could just be my silly HTC phone. Streaming options are currently limited. Right now you can watch Netflix, YouTube, or videos you purchase from the Google Play store. Don’t worry though – more options are coming. Very soon the Chromecast will support Hulu Plus, HBO Go, Vimeo, and more so this is one negative aspect isn’t something I’m very worried about. 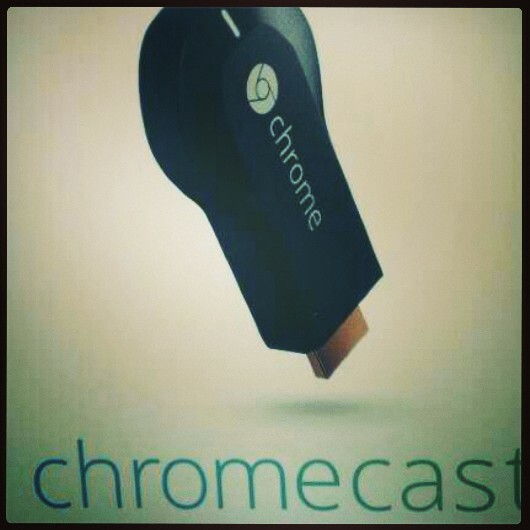 I think Chromecast is going to surpass Roku as the go to content streaming device. As they add content hubs like Hulu and HBO Go their sales will continue to skyrocket – and we’ve already seen them sell out. If you are a cheapskate like me and have avoided purchasing a device that lets you stream your content on your television, this is the device to jump on. It’s $35 that I certainly don’t regret spending. A definite 4 out of 5 stars goes to this ingenious little dongle in my Google Chromecast review. Do you watch programming on your TV via Chromecast, Roku, or Apple TV? What’s your favorite? Has it helped you kick cable to the curb and saved you money every month? I look forward to hearing from you money saving fiends. And if you are already doing the streaming thing here is my list of the top 20 things to watch on Netflix. I will probably pick one up eventually…why not for only $35. i actually had one pre-ordered but cancelled. I don’t do patience well. No hurry though as I have more than I need right now for streaming content with multiple Rokus, Apple TVs, and Xboxes. Great review. It really is a killer price James. Sounds like you have all your streaming bases covered right now though! I almost pulled the trigger on Chromecast, but decided at the last minute that having invested in two Roku boxes I didn’t need another device. And after reading just yesterday that the software behind the device is still “beta” and that features can randomly change without your say-so, I’m definitely not interested until the API is finalized. Right now the only advantage that I see Chromecast having is that you can pull up any webpage and have it broadcast to your TV, which makes it a breeze to stream Flash- and Silverlight-based content that hasn’t converted over to HTML5 or other streaming formats. That may change some if Plex becomes available on Chromecast, enabling you to stream videos stored on any computer in your home to your TV. It might beat Apple TV, which has its own flaws, but I doubt that it’s going to knock Roku off its perch anytime soon. The Roku developer API is pretty simple, straight-forward, and open for developers to tinker with. Their newest device that will be out later this year will be about the same size as Chromecast, maybe even a little smaller. I may buy in since I only have the older series 1 boxes, not the Roku 2 or Roku 3. Like you, I really have all the devices I need. Another thing that is giving me pause is the lack of content. Once they get Amazon Instant Video, Vudu, Hulu Plus, HBO GO, etc…. I totally appreciate your techie perspective Kevin. I’m not very good when it comes to that side. I just know if it works well and if it is a good money saving bet or not! I also bought a Chromecast. I bought it to make my old plasma tv into a smart tv. $35 is way cheaper than buying a new tv with the smart thing built in. Like you, I also have slight problems controlling the Chromecast with my phone. Sometimes the volume control does not work or will change it after 4 or 5 seconds. But, other than that, you can’t beat 35 bucks for all that it can do! Exactly Brian. I’m working on another post about buying TV’s. Smart TV’s are the equivalent of getting a GPS in your car. Bad idea because they become outdated so quickly. If you buy the streaming equipment separately you’ll save money and have a more up to date system. Thanks dude! And I think Aereo will come to Chromecast sooner rather than later. We have roku. I bought it off a friend who had an extra – we paid about $35. So far it has been awesome. Easy to use, no delays in programming. We have amazon prime and Netflix, and we find we have plenty to watch. Once in a while we red box it, if we can’t find what we really want. I would say roku sounds like it has more solid service than google chromecast for now, but also is limited for just having a bigger screen than your phone to see webcontent. At least either way, you are not forking a bunch of cash over to a cable company! We save about $75 a month this way. Very nice! I’m all about buying used. I hear fantastic things about Roku. The most important thing is cutting that cord, no matter what device you use to do it. Thanks for sharing. Do not tell anyone this!!! The hubby and I are huge TV watchers and subscribe to cable and most of the premium channels. We like to watch the new shows as soon as they air!! This is clearly a values based choice (not financial). Can you say; Boardwalk Empire, Dexter, Nurse Jackie, Breaking Bad, Suits, HBO documentaries, need I go on? 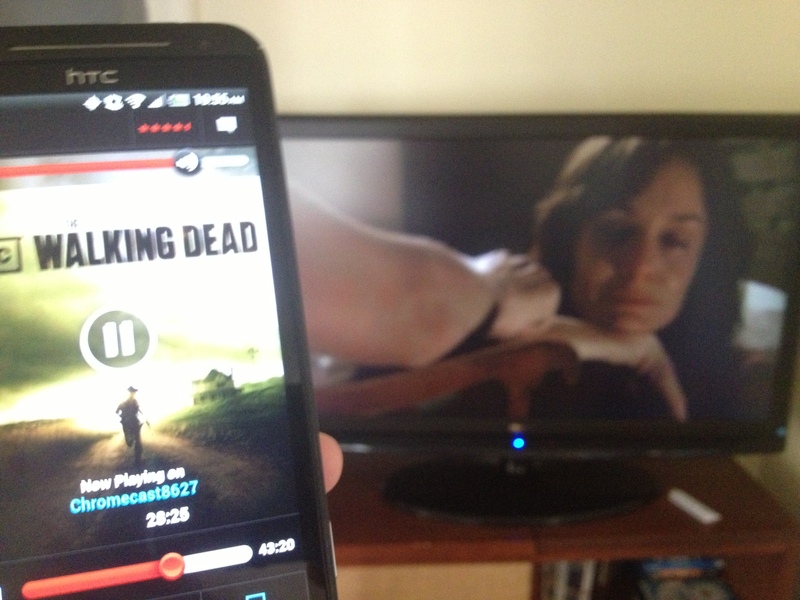 Do you think the chromecast would work for us? Chromecast is really only for folks that are watching TV through the internet. If you have a cable subscription you won’t really reap the benefits of it. You could still use it to play music through your TV (and accompanying surround system if you have it). And don’t worry. Your secret is safe with me. It’s definitely a values based choice. My husband has been lucky enough to be a beta tester for Roku so we have received 2-3 boxes for free. So we’ve enjoyed streaming on our TV for years now. Having a device to stream to your TV makes Netflix and Hulu Plus worth the money of subscribing to those in my opinion. Now if only HBO and Showtime would stream their shows without a cable/dish subscription we’d be all set! That’s a pretty sweet set-up Emily. How cool to get to test out the new stuff for free. And I think you are totally right. I had no idea what I was missing. Now I’m hooked!